So I have 2 pregnyls, 4 ampules, 2 1ml waters and 2 lots of 5000iu powder. Now 1 lot of 5000iu powder with both the waters(2ml) will give me 20 .1ml shots at 250iu right? But how do I mix them and store them, I dont think there’s enough space in the powder amp for 2 mls is there? And I don’t think trying to half the powder is a good idea. So I though get more bacteriostatic water but get 10 mls and make it easy. But the. I thought is it safe to get the water from Amazon? Best way is to mix it with injectable B12 instead of bac water. But anyway, check this link and scroll down to the segment on mixing, it should help answer your questions. Do you have to get a prescription to get injectable B12 at a pharmacy? I you get it locally, yes. But it's readily available online. Any website that sells t3, cialis, etc.. I can’t find b12 or bateriostatic water online in uk, found a site charging £20 from eu but dont really wanna spend £25 for 5ml.. If not will the way I said work with the 2ml that I have from the pregnyl? Look long enough find anything I guess. Found a medical supplier ordered enough stuff for a year of cycles lol. At least I’m prepared now if I get the itch. I’ll be on 2nd/3rd week bedtime I get it, hope that’s ok. I wasn’t going to take hcg cause everyone I know in real world doesn’t take and even on this forum some senior members seem not to bother. But if I get with a girl in the next three months I don’t want to look less than myself lol. Plus the extra text will help my minimalistic cycle. And of course I’ve read your post, I’ve read through them all, some multiple times. Your first cycle thread made me postpone my cycle nearly a year. The only reason I went with test/bold instead of test only was because the guy that sells me the gear is old school and started rambling about how 500 test pw is too much lol. So I’m on 300 each from pharmacom. Thanks for taking the time to replay austinite your a leg! So I finally got my bac water today. I though i ordered 5ml but I got 10ml. Is it ok just mix with 10ml and add half mill at 250iu? How to I open the vial of bac water to mix In The hcg ? Today is the start of week 4. It’s not too late to start is it? I’m doing ten weeks! Should I mix and start tommorow or just wait till I pin Thursday and add it in? Mix 1 mL of bac water with 5000 iu of powder. Then, in a new vial, add the mix + 9 mL bac water. That gives you 5000 iu/10mL of HCG. 0.5 mL will then be 250 iu HCG. I do 0.5 mL 2x per week, so 500 units total. Post pics of the bacteriostatic water and hcg amp. Mix 1 mL of bac water with 5000 iu of powder. Then, in a new vial, add the mix + 9 mL bac water. That gives you 5000 iu/10mL of HCG . 0.5 mL will then be 250 iu HCG. Cool but I can’t work out how to open the vial of bac water lol. I’ll post a pic when I get home, thanks. you don't pop off a vial, you use your syringe to get the liquid out. Haha think I was a bit dumb. So new plan, remove 1ml from the 10 ml vial, mix with hcg powder, draw back into syringe, add back to the vial. Sound good? Oh and how long will it last for? Now you have a vial with a legit 10ml in it. 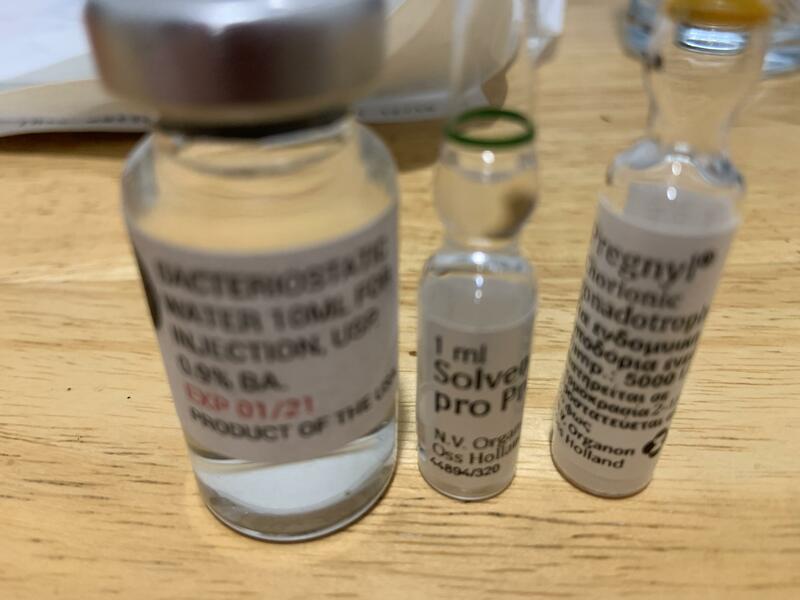 Draw up 1ml, put it in the hcg amp, mix it slowly, redraw into syringe, send inject that 1ml hcg 5000 into the 10ml vial of bacteriostatic water. You now have a concentration of 5000iu per 10ml (500iu per 1ml) so for your 250iu dose you just pin .5ml of solution. Lol yh that’s what I said.. The ten mil vial of bac water contains 10ml! Oh and how long will it last in fridge? Last edited by Littlearnie; 02-07-2019 at 10:49 AM. You can check total volume by pulling all water out with 3ml or 5ml syringes. I have 5ml vials that will hold 7.5ml if filled to stopper. I have 10ml vials from some ugl's that pride themselves on filling the vial to the top, which is 12ml. Ah ok good to know. But yeah I just took two 5ml syringes and filled them and that was it. You take hcg up till your last pin yh? And if I had at the beginning would I normally start from the first pin? Also am I right in thinking that with hcg my normal test production resumes and is added to the test I’m adding to my body? Or does it not work like that :/. Hcg from first pin to 3 days of start of pct. So if you are on test E or C, you'll take last shot of test 14 days before pct and stop test. But you still have exogenous test in you and are shut down. During this 2 week washout period, you'll still be on HCG protocol until 2-3 days before pct. Hcg circumvents total shut down by mimicking LH and FSH pulsing keeping testicles motors running, so in pct you have one less hurdle to overcome.